What they promise: The high PH replenisher opens the cuticle of the hair and infuse Keratin proteins, and with it’s deep, penetrating action it repairs and revitalizes hair during blow-drying or flat-ironing. Although this package may seem pricey, it comes with both the INFUSION keratin replenisher and the INTENSE RX ionic keratin protein restructuring serum. Both of these products work together to replenish the hair from heat damage, as well as protect it from any future blowdrying and ironing to the hair. It’s an easy product to use and never leaves my hair feeling like there’s any or a lot of product in it. I noticed after using the Keratin Complex repair therapy duo that my hair felt and looked healthier. I even recieved compliments from friends and family members, that my hair was looking a lot fuller! 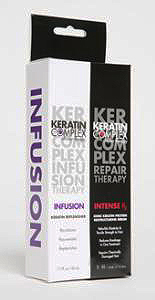 If you are looking for a great and easy solution to bump some life back into your hair, try this Keratin Complex Repair Pack.